The capital is best reached by driving or taking the bus to the outskirts and then catching a (very frequent) commuter train – www.rome.info has helpful tips on using public transport in Rome, and a page on ticket prices. You can currently buy an €8 daily ticket that will get you into Rome and is then valid on all forms of transport throughout the day. If you prefer to drive into the city centre, a recom­mended route and a suggestion for cheap all-​​day parking are included in the Casa Capena information pack, which will be sent to you when you make your booking. 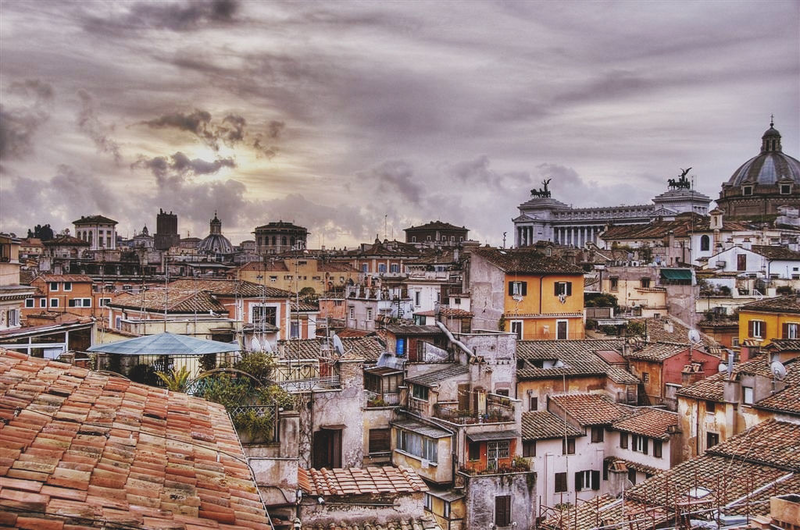 The Eternal City’s countless attractions include its museums, galleries, churches and archae­ological sites, the Villa Borghese park, the Spanish Steps, the Trevi fountain, Piazza Navona and of course the Vatican. Frommer’s website includes plentiful information to help you plan your visit. Adolf Würth was a German industrialist who made a fortune from screws and other fixing and fastening products. The company that he established runs a non-​​profit cultural foundation that owns galleries of modern art in ten European countries. It’s a tribute to Capena’s status as a città d’arte that the Würth Foundation’s Italian institution has been sited nearby, on the Viale della Buona Fortuna. The Art Forum Würth Capena is open to visitors from 10am to 5pm, Monday to Saturday, excluding public holidays, with free guided tours every Saturday at 11.00. There’s no admission charge on any day. Rome and Lazio boast many fine golf courses. For winter sports, Terminillo is just over one hour’s drive away and the Abruzzo National Park contains many fine ski resorts; Ovindoli is partic­ularly recom­mended. If you like walking, you might be interested in helping a local environmental group in its campaign to open up Capena’s old footpaths: ask us for more info. The Cavalsuonando nature park is located on outskirts of Capena. Caval­suonando (literally ‘horse-​​riding to music’) is a unique activity that aims to achieve mental and physical wellbeing and is particuarly suited to children. The scheme is run by horse-​​trainer, classically trained musician and mandolin player Settimio Malatesta, in conjunction with Ilaria Tempestilli, a physical education graduate who specialises in motor skills. Hidden Lazio is Casa Capena’s sister website, with dozens of ideas for days out in west‑central Italy. Rome boasts a wealth of designer shops, reaching the peak of luxury in the Via Condotti, which begins at the base of the Spanish Steps. McArthur Glen has a designer outlet village south of Rome – Castel Romano. The village’s 95 stores include Valentino, Dolce & Gabbano and Zegna. For information on local shopping in and around Capena, please see this page. You can reach a few reasonable beaches from Capena in about an hour but you need to go further afield for more picturesque coastline. We recommend Il Villaggio dei Pescatori in Fregene (beyond Fiumicino) for a decent beach and reasonably-priced unpretentious fish restaurants: Singita Miracle Beach is great for mojitos at sundown. A favourite place a little further afield is Sperlonga, a spectacular white cliff town overlooking long sandy beaches between Rome and Naples. This is where many Romans go to bronze themselves during the day and dance away the night. Forty minutes’ drive from Capena, Lake Bracciano is a good alternative to the coast in summer. The wedding of Tom Cruise and Katie Holmes brought Bracciano to the world’s attention in 2006. We recommend the Paradiso sul Golfo restaurant, Viale G Garibaldi 92, Trevignano for a great lunch with a panoramic view across the lake. Trevignano also has an interesting bric-a-brac market from dawn to dusk the first Sunday of every month. Not far from Bracciano, Lake Martignano is tinier and more unspoilt. It takes a little perseverance and a certain amount of off-road driving to find but is definitely worth the effort if you want to go off the beaten track. There is a free beach (though you have to pay for parking) accessible along a very pot-holed road. The road to the private beach at Agriturismo Il Castoro is much better. Il Castoro costs €5 per day for admission and offers free hammocks and a restaurant on the water’s edge. One hour’s drive from Capena, Lake Bolsena is located in an inter­esting area. The photo above shows a statue at Rocca dei Papi, overlooking the lake. 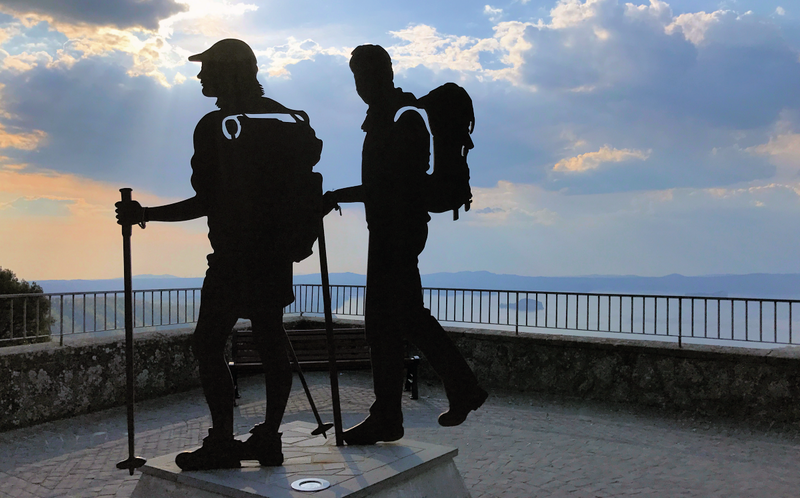 It is intended to celebrate the Via Francigena pilgrim trail. While you’re here, why not visit Monte­fiascone, Capodimonte and the amazing Bomarzo Parco dei Mostri with its grotesque statues? This garden of monstrous sculptures was created in the 16th century and was intended “not to please but to astonish”. It has inspired numerous artists and writers, including Salvador Dali and Jean Cocteau. Lazio has many natural hot springs that were enjoyed by the Etruscans and then the Romans. Further north, you could spend a day lazing in and around the thermal pool at the very upmarket Fonteverde spa resort, with its fabulous views of the Tuscan countryside. Health and beauty treatment sessions are also available at Fonteverde’s ‘wellness centre’ (centro benessere). A visit to Tivoli is perhaps the day trip that most consistently delights our guests. This ancient town, which was called Tibur in the era of the Roman Empire, possesses numerous histor­ically important sites, notably Hadrian’s Villa (Villa Adriana), a complex once occupied by the emperor Hadrian, Villa Gregoriana and Villa d’Este, a beautifully landscaped Renaissance garden with waterfalls, nymphs and grottos. Thirty minutes’ drive from Capena, Calcata is a fine example of a walled medieval village that has attracted a community of artists and contains inter­esting and quirky shops. Click here to view the separate page on this area.